UNITED NATIONS – A Vatican official told a U.N. gathering on climate change that Pope Francis’ new encyclical is calling on all societies to examine how they produce and consume goods and on all the world’s people to realize the role they, too, have in addressing global warming. Cardinal Peter Turkson, president of the Pontifical Council for Justice and Peace, echoed many of the sentiments raised by the encyclical during a June 29 address. 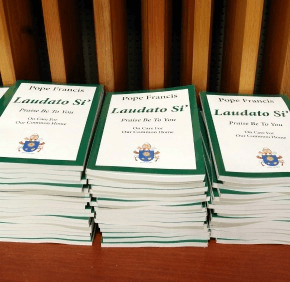 In the document, “Laudato Si’, on Care for Our Common Home,” the pope argues that “climate change is a global problem with grave implications: environmental, social, economic, political and for the distribution of goods,” the cardinal said. The cardinal told the U.N. group that “prudence and precaution must prevail” and that modern society needs to recognize the need for changes of lifestyle, production and consumption. To this end, Cardinal Turkson said world leaders must develop policies to drastically reduce emissions of carbon dioxide and other highly polluting gases. “The use of highly polluting fossil fuels — especially coal, but also oil and, to a lesser degree, gas — needs to be progressively replaced without delay,” he said, calling for more widespread use of renewable sources of energy. The cardinal said society needs to examine how it produces and consumes goods but more importantly, he said, people must change their hearts and minds. On June 30, Cardinal Turkson spoke at a related climate change event. He was joined by Archbishop Bernardito Auza, Vatican nuncio to the United Nations. Other speakers included Archbishop Demetrios of the Greek Orthodox Archdiocese of America and Father John Chryssavgis, a Greek Orthodox priest who is an adviser to Ecumenical Patriarch Bartholomew of Constantinople on environmental issues. A few days earlier, he told an international gathering of agricultural leaders in Milan, Italy, that farming is a “noble vocation” and tied it to the new encyclical. The cardinal delivered those remarks at the beginning of a symposium on faith and farming during the World Expo in Milan June 27-28. The symposium was part of an initiative led by Catholic Rural Life, a U.S. organization, and the International Catholic Rural Association in partnership with the Pontifical Council for Justice and Peace. In his presentation, Cardinal Turkson highlighted the connections between “Laudato Si'” and agriculture, stressing that agricultural leaders must pay attention to both human and natural ecology. He outlined a number of challenges facing contemporary agriculture, including industrialized operations that encourage waste, damage the environment and displace small-scale farmers. He also addressed the use of genetically modified organisms, or GMOs, which he said are not bad in their own right, but have “associated evils,” such as the concentration of productive land among a few owners, increased use of pesticides and the loss of opportunities for rural workers. The cardinal, echoing some of the points made in “Laudato Si,'” stressed the importance of investing in rural infrastructure and developing sustainable agriculture. “When farmers, traders, buyers and sellers see their wealth as a common good rather than just private property and the food they produce, prepare and distribute as sustenance we share — then the whole enterprise will sustain our human being and our common home,” he said.